Bakers and confectioners made special cakes, wafers and biscuits to celebrate religious festivals, saints' days and other events in the Church calendar. 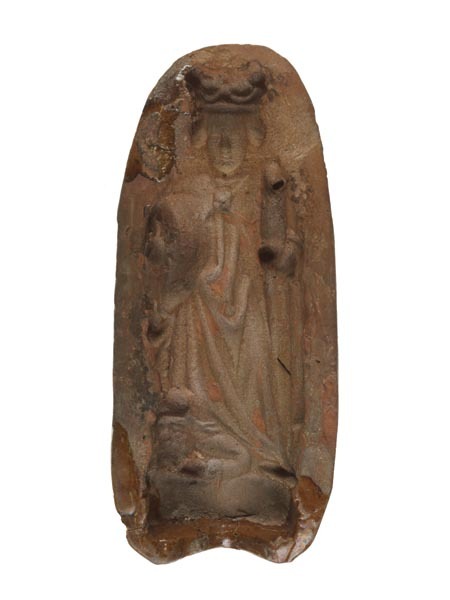 This terracotta mould, carved with the figure of St Katherine, was probably used on the saint's feast day on 25 November for the mass-production of 'almond breads' (marzipan) or 'bisket breads' made from fine flour, eggs and sugar coloured with saffron or some other natural colourant. St Katherine was one of the most popular saints in the medieval period, and there were many chapels, chantries and churches dedicated to her memory in London.